American Online (AOL) is a desktop-based application that creates a Personal File Cabinet (PFC) file to store user’s email messages, contacts, calendars and much more. Not so long ago, AOL email client was one of the most popular web-based emailing services in the United Kingdom. As a result, the opportunities for criminals to perform their illegitimate activities such as spoofing, spamming of emails, cyberbullying, sharing of pornographic images via emails also increased on this platform. So, to stop all these activities, the need of AOL email forensics rose and to fulfill that need a third party tool i.e. AOL Email Viewer came into play. Forensic analysis and examination of email artifacts play a significant role in the digital forensic investigation. There are a number of utilities available in the form of email forensic software. At this stage, the biggest challenge for investigators is to select the forensic software that not just opens and view AOL email messages but also extracts other crucial objects from the suspect’s mailbox. Most of the time, a wide variance is observed in the output generated by many of the email forensic utilities. AOL email viewer is a forensic application which has been specially designed for investigators to extract crucial evidence from culprits’ mailbox via a number of ways which has been detailed below. The software has the ability to browse the file format from the desired stored location. 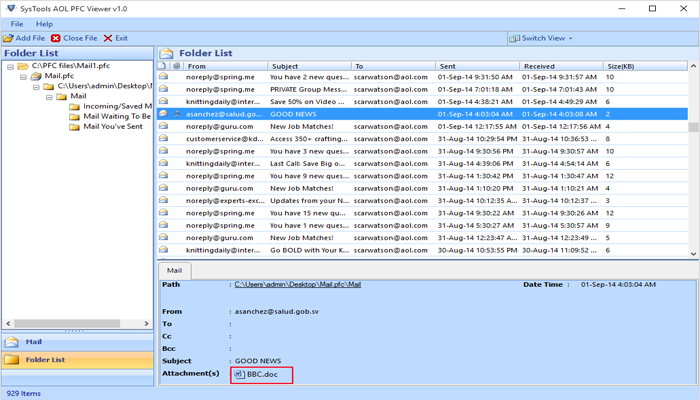 After loading the AOL PFC file, it will generate a complete preview of all the email messages available in each folder. A user can analyze every email messages along with their attributes like from, subject, to, sent, received and mentioned the size of the email in KB. 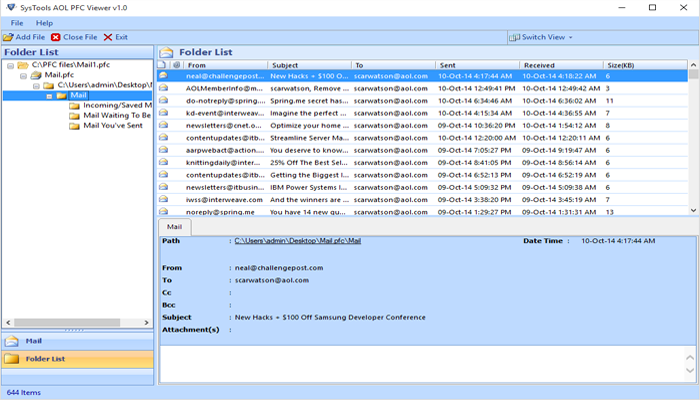 It enables experts to view emails with attachments and their internal embedded signature. During an investigation, officers of law enforcement use different types of email forensics tools for recovering evidence from a suspects’ machine. Forensicators can rather choose AOL email viewer which creates a comprehensive report of the user’s mailbox after processing it. This facility makes the tool a unified solution. One of the most exclusive features of AOL email forensics software is it does not require AOL installation to open & examine PFC emails with complete folder structure. Using this feature, investigators can easily analyze and extract the evidence from a particular folder of the culprit’s mailbox. The carving mechanism of the software is the result of our researchers and team of developers. In U.S., the AOL email forensics is used by many investigators to analyze and carve evidence from the seized machine. One of the best aspects of the tool is that because of its simple installation & user-friendly GUI it proves to be a resourceful utility not only for investigators but also for general users. Owing to its homogenous features, AOL email viewer creates a comprehensive report of the case that can instantly be viewed and submitted in the court of law.